A lot of students tremble with fear when they hear the word “essay”. It's no wonder, however, as one needs to make a great statement, prove it, summarize; the whole work should be captivating, follow the right structure, contain fresh ideas. How to remember each detail and stay sane? Moreover, if you are passing a writing test, your time is often limited, so you have to think fast. In fact, there is a simple and easy-to-remember essay pattern that makes writing any type of essay a breeze, be it a narrative, critical lens, argumentative, or contrastive essay. Check out the following prompts towards a classic 5 paragraph essay format and put an end to doubts and fear while creating your A-Grade essay. Sounds delicious, doesn’t it? Imagine your favorite hamburger – juicy and fresh, with soft buns and a yummy filling in between. You know how it looks like and you definitely remember its taste. Now try to take this hamburger as a framework for your essay. Obviously, there are five elements that make a classic hamburger. Likewise, there are five paragraphs that constitute a classic essay. What's on top of the hamburger? The top bun! Consider it to be the intro part of your essay, where you introduce your main idea and thesis. What comes next? The lettuce. Set the first essay argument that supports your thesis and use examples to prove it. Then comes the cheese, right? Provide the second argument and example. And here comes the meat patty! That’s your third part of supporting arguments together with some evidence that confirms the initial statement. Finally, the bottom bun. It is your conclusion that restates the thesis and summarizes everything mentioned above. All in all, hamburger essays consist of an introduction, three body paragraphs, and a conclusion. The hamburger model for writing seems to be a perfect guideline which is always appropriate and really easy to memorize. Of course, there are many different essay patterns, but the hamburger writing method is still the most commonly used one. First of all, remember the 3Cs rule: Capture, Claim, Conclude. Capture your readers’ attention with the help of essay hooks, such as quotes, statistics, unknown facts, sarcastic statements. Hook is a brilliant device in order to awake the interest of your target audience. Use hooks both in the intro and concluding parts. Claim your statement. Provide arguments using facts, literary or scientific examples, famous sayings. Claims should be presented in body paragraphs. Conclude the essay and summarizing the arguments. Finish your work by proving the essay thesis and encouraging the reader to further explore and study the topic you have presented. Let’s highlight the crucial requirements of a standard hamburger writing plan and illustrate it with the corresponding essay abstracts. The first question to be answered is how to start a 5 paragraph essay. One of the best ways to do it is to provide a bright quote, mentioning its author as well. It works as an efficient hook to grab one’s attention. Another advantage of using quotes is their potential to produce controversial opinions: one and the same quote often allows to come up with three supportive arguments, as well as three refuting ones. Statistics and facts are a good alternative to quotes, helping to hook the reader from the very first sentences. Start with a general sentence to introduce your topic. Write your hook then, and rephrase it with your own words. That’s your thesis, your main idea that is going to be proved throughout the whole essay. Health problem is one of the most pressing issues nowadays. Modern generation rushes to progress with the technologies and increase the speed of economic growth, impairing the health standards at the same time. Pollution of the environment, contamination of water, soil, and harvests, spread of GMO, and popularization of fast food pose serious threats to one's health. Anthelme Brillat-Savarin once wrote, “Tell me what you eat and I will tell you what you are.” Obviously, the food quality affects the general health of an individual and determines the quality of one's life. Hamburger model writing requires three body paragraphs, similarly to three hamburger layers. Each body paragraph should express a single idea and support it with appropriate claims. Facts, statistics, authoritative people’s statements need to prove your thesis in a logical manner. The abstract should begin with an opening statement and end with a concluding one. Firstly, the contrast between healthy and unhealthy food is best illustrated by its impact on human health. Fresh fruit and vegetables; whole grain products; low in fat, sugar, and salt meals enrich the organism with vitamins, minerals, nutrients, fiber, and antioxidants. At the same time, unhealthy processed food leads to a number of diseases, such as diabetes, high blood pressure, Alzheimer’s disease, depression, and even cancer. For example, American Diabetes Association states that a single serving of fast food contains approximately 1,000 calories, which leads to Type 2 diabetes, problems with kidneys, hypertonia. Therefore, healthy eaters protect themselves from health deterioration, while unhealthy food causes serious harm and sometimes even incurable diseases. Secondly, both quality and quantity of food influence your body shape. Healthy products saturate the organism with essential elements, keeping it physically fit. On the contrary, products that contain high amount of fats and cholesterol lead to obesity. According to the United States Census Bureau, the rate of fat consuming in the USA rose from 57 pounds per capita in 1980 to 78 pounds in 2009. As a result, the U.S. Centers for Disease Control and Prevention inform that nearly 78 million American adults and 12.5 million children and teenagers suffer from obesity. Numerous researches conducted by Wang, Y Claire, McPherson, and others prove that nearly 27% of young Americans cannot serve in the military for the reason of being physically unfit and obese. Thus, unhealthy consumption leads to severe consequences, the rate of which is quickly growing and presents both personal and even national threat. Thirdly, everyday food choice influences the immune system a lot. The whole marketing sphere aims at promoting only those products that bring income, not those that improve health. So, the products look and smell really good, but at the same time they act as health killers. Processed food, packed with preservatives, sodium, emulsifiers, excess of sugar and salt, weakens the immune system, destroys the organism’s protective function, and reduces its natural resistance to diseases and infections. Dr. Ian Myles from the National Institute of Allergy and Infectious Diseases claims that any harmful element coming into the organism changes the health profoundly. The upshot of the matter is the increased level of allergies, inflammations, cancer, which harms not only the present generations, but also the ones to come. The DNA encodes the parents’ food habits, passing on physical characteristics to the offspring, together with the immune system predisposed to diseases and infections. Therefore, proper dietary standards keep the immune system of the individual strong and determine the health quality of the future generations. Being the last part in the hamburger paragraph structure, conclusion should present the logical outcome of the arguments introduced in the body paragraphs. You have to restate the thesis once more, but don’t just copy paste it from the introduction. Rephrase it and then briefly mention the idea of each body paragraph. Thus, make your readers come to the conclusion that your thesis was 100% true and it was totally proved. Those facts that you chose as arguments have to persuade the audience. End your essay with some intrigue and encourage your audience to further research the topic. Finally, the food we consume on the daily basis determines the health of both modern population and the future generations. Depending on the dietary choices, people may either physically thrive or suffer from dangerous illnesses. Healthy lifestyle, particularly the appropriate quality and amount of food per serving, leads to revealing the whole potential of the organism, while consuming the products of poor quality, especially fast food, results in obesity and physical unfitness. Moreover, our eating habits are directly connected with the DNA, which allows to foresee the future health condition of the entire nation. So, food is not just the reason we exist, but also a way of influencing the society and regulating the national health. The hidden force of food is not yet completely learned and will surely be further discovered. Your hamburger style writing is complete now. It wasn’t that hard, was it? Here is the reason: every time you learn something, you just need to connect the unknown or difficult element with the one that is familiar to you already. Learning the hamburger method of writing an essay takes your imagination to the next level, making is super easy to associate the essay features and requirements with that of a hamburger. 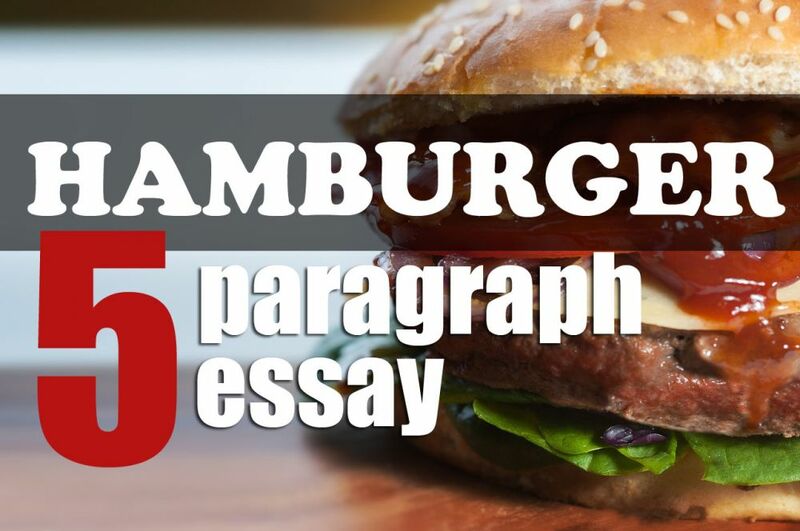 Just visualize the five hamburger layers and project them onto five essay paragraphs. That’s it!